The Europeana TV pilot exploits the opportunities of re-using Europeana content in SmartTV applications to create new TV experiences. A technical framework provides an environment to analyse, personalize and present Europeana content. The pilot supports and evaluates two scenarios in which video material is brought out of the archive and onto the viewer’s screen. 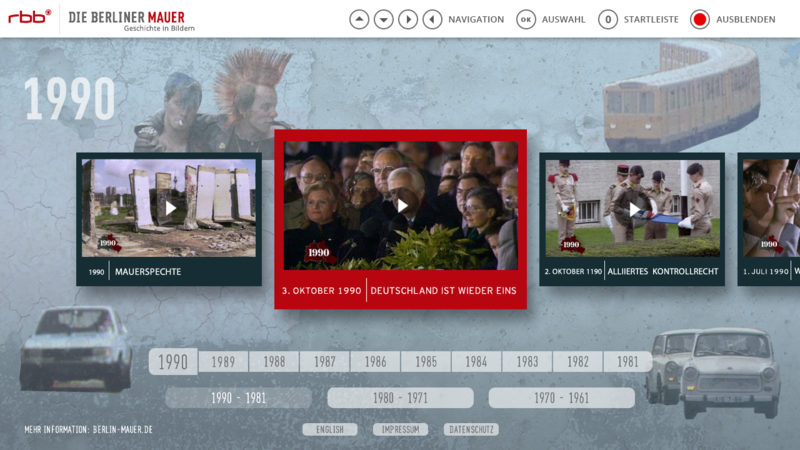 For the broadcast scenario, RBB developed an HbbTV application based on the Berlin Wall. The SmartTV application, targeting a social community, is based on archive videos about the building of the Berlin Wall in 1961 up to German re-unification in 1990. The local community scenario led by Sound and Vision focused on applications for an immersive user experience in the living or class room. It investigates use cases such as the elderly re-living personal memories through TV content or pupils learning about historic events. Examples of use cases for the Europeana TV scenario. Content for the pilot is delivered by Istituto Luce – Cinecitta, RBB and Sound and Vision. Technical partners Noterik, NTUA and Pronton Labs support the realisation of the pilot.